Carolyne Roehm understands the art of an elegant table setting and illustrates this beautifully in her celebrated book, A Passion For Blue & White. We love the addition of pink blossoms here, and think our tented Vera Wang Peony Place Cards would add just the right touch for spring and summer weddings! See our matching Peony invitation and website template here. 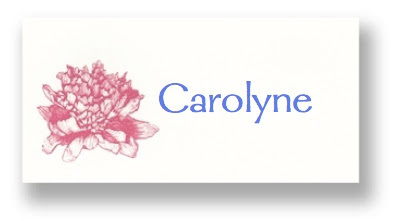 You can see our full assortment of Place Cards here. Gorgeous! I love pink and blue together. I adore peonies :) Such a bright, full flower...so pretty! Hi Jen, pink + blue... fab indeed!! Hi Cat! We love them, too!